Many newly engaged couples look forward not only to the glamour and romance of their impending Big Day, but also to starting a family in the near future. And for those who do plan to have children, there is often a concern about what state the planet will be in when those kids are grown–so there is no better time for couples to start ensuring they safeguard their children’s future as much as possible by consuming less, and consuming greener – starting with their ethical engagement rings. Fortunately for those in the market for conflict-free, sustainable engagement rings and wedding bands, there are more and more jewellers who incorporate eco-friendliness into their business to ensure they are not contributing to unethical and polluting practices in the mining of their stones, gems, and other precious materials, mainly by upcycling existing ones. 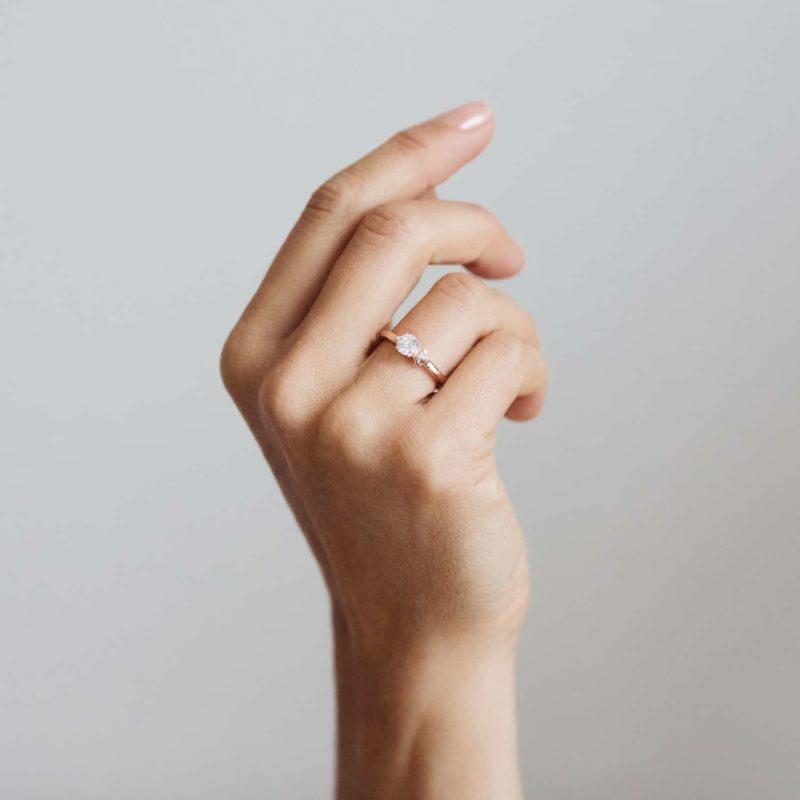 The best part is, you won’t have to win the lottery in order to afford one of these eco friendly engagement rings: although they’re greener, they’re often not as expensive as most mainstream ‘dirty’ jewellery, so you can save money whilst saving the planet. Anita Ko’s unique and delicate Art Deco-inspired ring is perfect for the bride-to-be who prefers a more vintage look. Cast from 18-karat rose gold, this dainty design has a hexagonal-cut diamond center and 0.20-carats of hand-set pavéd stones that reach halfway around the band. Anita Ko is a member of the Responsible Jewellery Council, which ensures human rights, labour rights, environmental impact, mining practices and product disclosure are all ethically dealt with throughout the creation of each and every ring. Founded by two Stanford graduates, Brilliant Earth produces refined and eco-friendly jewellery items. Their ethical practices ensure that all of their materials come from mines that follow strict labour, trade, and environmental standards. They also only accept diamonds from areas that possess a fair trade diamond certification. All of their gold and platinum is recycled in order to further reduce the need for mining these materials, and part of their proceeds are donated to help diminish the unfair labor issues in other mining countries. So which is the best ring from this brand? The one you create! Brilliant Earth has a simple three step process, allowing customers to choose the setting, diamond and cut of the ring they’ll be wearing for a lifetime. 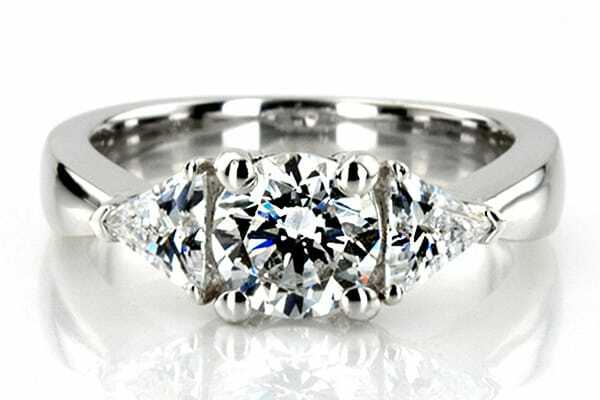 If you are looking for a one of a kind, eco-friendly, engagement ring, look no further than Monique Pean. 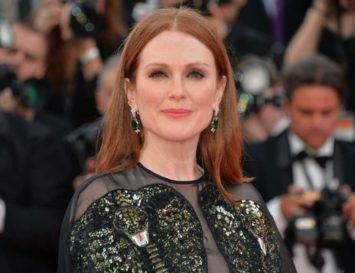 Known for using unique materials, including fossilised dinosaur bones and ancient shark teeth, she has a signature avant-garde style unlike any other. She uses recycled gold and platinum and all of her diamonds, gems and even fossils are guaranteed to be conflict and devastation free. 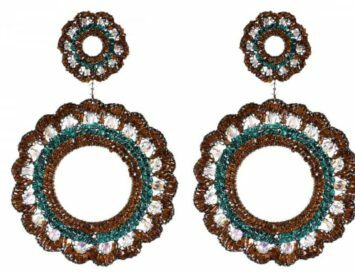 As an added bonus, proceeds from her sales go to bringing those in developing countries clean drinking water and basic sanitation. Our pic from her engagement ring line would be the mineraux oval rose cut diamond, crafted from recycled oxidised platinum. This stunning ring is set with an antique white oval rose-cut diamond surrounded by a halo of pave diamonds, as seen below. This unusual engagement ring is crafted from 14-karat gold in an elegant wishbone shape, which allows you to change the direction of the tip to suit your style. 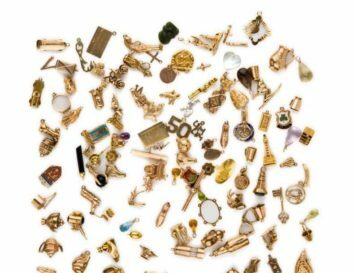 Stone and Strand are strict adherents of the standards and ethics of the Responsible Jewellery Council. This ethical engagement ring by EOS is made from certified Fairtrade gold and conflict free diamonds. We love the beautifully cut diamond as its centrepiece: it’s an old mine cut, which is the earliest form of the modern brilliant cut, faceted by hand in an almost round shape with a high crown, small table and open culet. Old mine diamonds were cut for candlelight, which makes them sparkle in even dim light. They have such a lovely antique look and feel about them! This Cherry Blossom ring features a polished, simple band with a central round-cut diamond in a size of your choice. Two small roses complete the design as within lies 1.5mm and a 1mm diamonds with a grain setting. These stones are responsibly sourced, are set in an 18ct Fairtrade gold band. 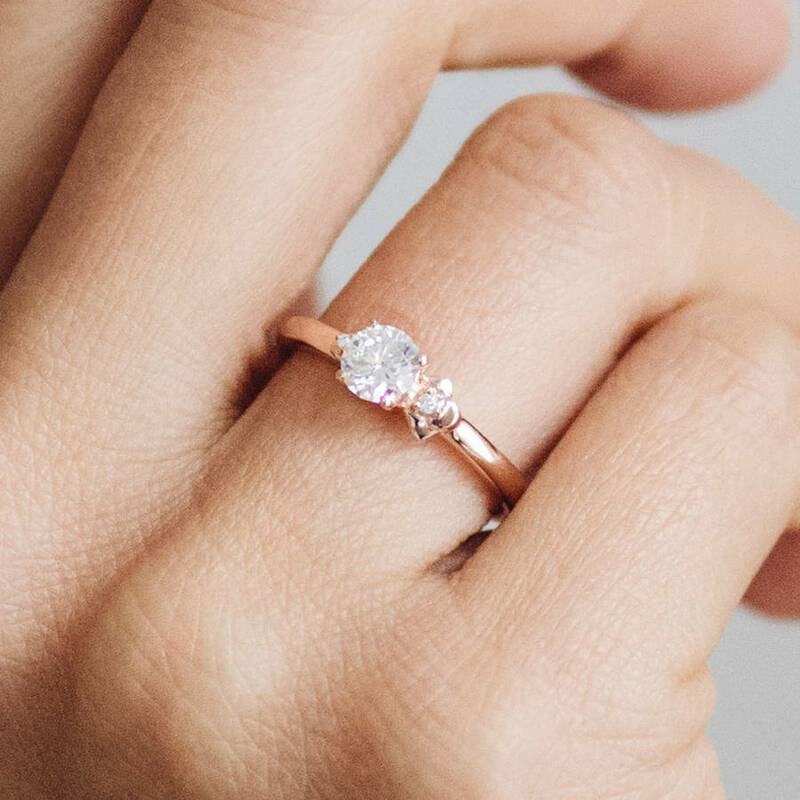 The ring even comes with a certificate of origin to assure you that your engagement ring has been made with the most ethical materials available. Featuring a more classic style, Andrea Bonelli is also a jeweller dedicated to eco-friendly practices. She uses mostly recycled materials and does her best to work with outsourced stone cutters and diamond suppliers that follow ethical mining standards. Many of her engagement rings feature simple bands and designs which add to a rustic look. 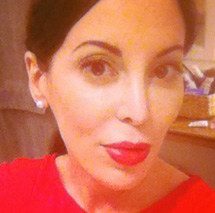 She does have stores that feature her designs in California and the UK; however, if you are in any other location your best bet is to shop her online gallery. 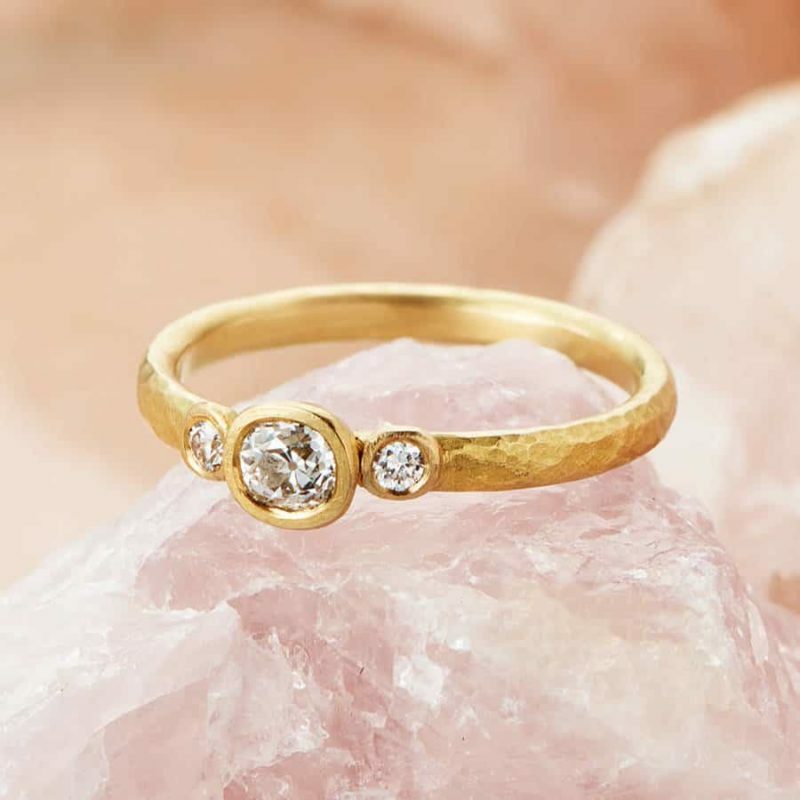 A delicate moissanite ring cast in eco friendly 14k gold is our pick of the Bonelli bunch. The Bali based brand takes forest management and water conservation seriously, and the cultivation of bamboo in particular helps them maintains both goals For starters, the company offsets its carbon output by planting bamboo all over Bali. Moreover, for each piece of John Hardy’s Bamboo Collection sold, the amount of bamboo that will be planted by the company as a consequence of the purchase is written inside the ring, bracelet or pendant, to remind the wearer of how their purchase will benefit the Earth. And the benefits are substantial: total of over 600,000 stalks were planted at last count. Aside from their forest management and water saving activities, the company supports many eco-charities, ranging from the Hong Kong Shark Foundation to the WWF and Redress, and also provides job training for Balinese orphans. What better way to kick off a marriage than by knowing the purchase of the symbol your union has contributed to such good? The brand’s diamond pave ring, below, comes embedded on a charming gold bamboo foundation, referring back to Hardy’s Balinese base. Whether you haven’t got a huge budget or just want to avoid a diamond engagement ring, this Green America Certified business has a ring for you! All of their jewellery is handcrafted and their selections range from artisan style, to vintage, to classic engagement rings. 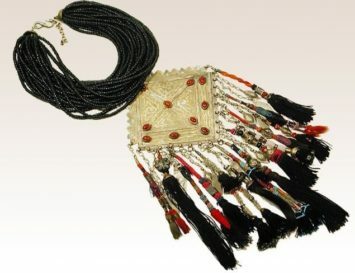 Their attention to detail in all of their handmade pieces will ensure your happiness with the finished product. Prices here are very affordable, and their shipping and return policies are also very flexible, making them a worry-free option if you decide to go the eco-friendly ring route. Turtle Love’s hand-carved Florence ring, below, is but one of the stunning vintage rings the brand offers for sale. Josh Opperman knows how to turn heartache into money. After being dumped by a former fiancee, he decided to sell the ring he bought for her. 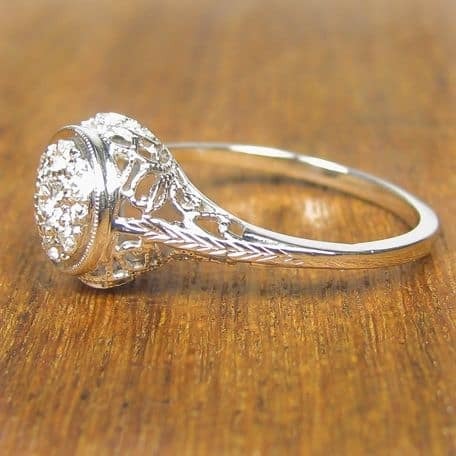 Wishing to sell the engagement ring for its maximum value, he created a platform where sellers could unload leftover relationship assets and buyers could find recycled jewellery at the right price. 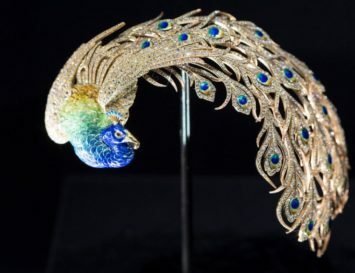 Today, I Do Now I Don’t has grown from a simple website into a major luxury e-tail site, expanding its goods from only engagement rings to now include estate jewellery and watches. The site has been featured on Good Morning America, CNN and more, and Opperman promises it will always remain a “green retailer” – a critical component for its customers. I have wonderful piece of jewelry, spiritual and very meaningful. 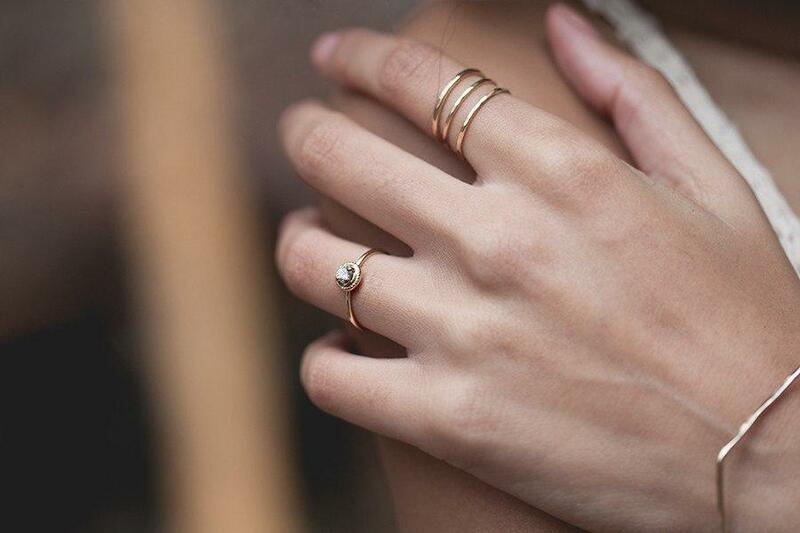 Wonderful rings, I like this post so much. Great post, very useful for me, and my fiancee! Depending on your budget this is onee area with a bit of wiggle room. 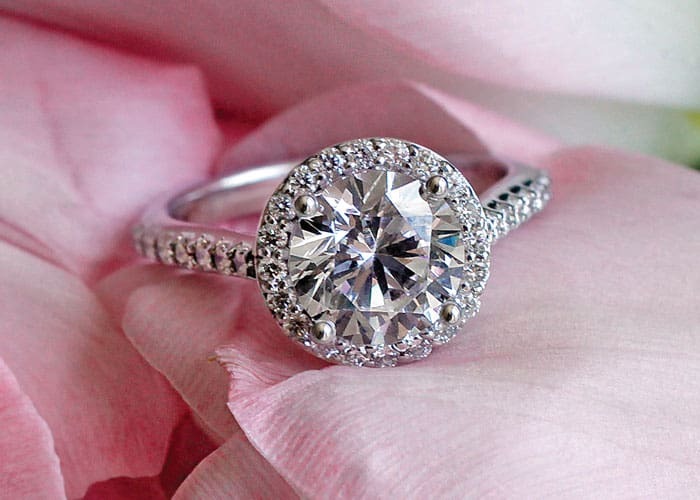 An engagement ring will be one of tthe most amazingg things you will ever buy ffor her. Diamond ring is the most common for engagement ceremony. Fantastic article, some people don’t understand or know where their engagement ring has came from and the impact it could have on the environment. Actually, we know these brands very well and each and every one is a small, artisanal maker, except for I Do Now I Don’t, which ‘recycles’ unwanted jewellery….